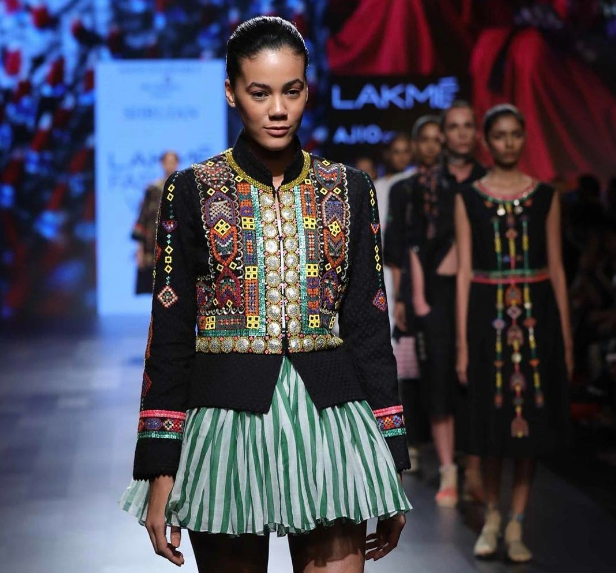 Artisans of Kutch were showcased as designers at the Lakmé Fashion Week Summer/Resort 2017 on February 2, 2017 in Mumbai. Shrujan, Women on Wings business partner from Kutch, presented a special collection at the fashion show; an important landmark for the growth and recognition of its work. Mumbai based designer and one of the founding trustees of Shrujan, Sudha Patel, along with popular Australian designer Pamela Easton presented a contemporary womenswear collection with embroideries from Shrujan artisans. Shrujan employs over 4,000 women across 100 villages and does exhibitions of readymade garments and saris all over India. Women on Wings and Shrujan started collaborating in 2011. The Artisans of Kutch show is part of an initiative by IMG Reliance called the Sustainable Fashion & Indian Textiles Day. IMG Reliance has been at the forefront of promoting Indian handlooms and this show put the spotlight on the artisans that create some of the greatest handloom stories. The team of curators has spent months working with the artisans from Kutch to bring this alive on the Lakmé Fashion Week ramp.